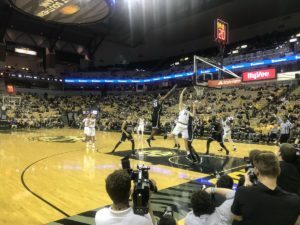 The Missouri Tigers played their first regular season game of the 2018-2019 season, and while losing to the visitors from the Southland Conference was never a real threat, there were warning signs that Tigers fans can look back on if this team doesn’t have the level of success they did last year: The two senior scholarship players on the team brought no offense, sophomore center Jeremiah Tilmon had four fouls yet again, and Mizzou didn’t shoot lights out from three, as they had to last year to win 20 games for the first time since 2013-14. The Tigers got off to a quick start, taking the lead to 16-5 just four and a half minutes into the game behind three three-pointers from Mark Smith. That wouldn’t be the last time we heard that name. Central Arkansas would cut the lead to 20-16 Mizzou, but the Tigers closed the half on a 10-4 run. Mark Smith started the second half the way he did the first, with two more threes, bringing his total to five in the game, a personal record at the collegiate level for him. Smith’s fifth three-pointer brought the Mizzou lead up to 38-23. The lead would stay nearly the whole game, as it was a defensive struggle in the second half, very similar to the first half. The Tigers would end up winning, 68-55. It was apparent that last year’s seniors Jordan Barnett and Kassius Robertson weren’t walking through that door anytime soon, as Robertson is in Germany, and Barnett is in the G-League right now. Those two were the Tigers leading scorers last season, and Missouri could’ve used both Tuesday night. Mizzou shot just 30.8% from behind the arc, 7.5% below last year’s clip. Mark Smith and Javon Pickett combined to shoot 7-11 from three, while the rest of the Tigers combined to shoot 1-15. The Tigers decided to start Jordan Geist, Mark Smith, Javon Pickett, Kevin Puryear, and Jeremiah Tilmon. Of those, Pickett was the surprise. Some thought Torrence Watson, the explosive freshman guard of ESPN’s top 100 recruits of 2018, would start, but instead he was the last one off the bench for the Tigers. He still tallied 24 minutes, sixth-most on the team. Mark Smith finished with 19 points and added a career-high 10 rebounds, his first double-double in college. Jeremiah Tilmon also added 16 points, five rebounds, two each of steals, blocks, and assists. Those two scored more than half the team’s points. Mizzou has a much stiffer test Friday, as they travel to Ames, Iowa, to take on the Iowa State Cyclones. Mizzou blew the door’s off Iowa State last year, but Iowa State has improved, as many think they will be dancing in March this year. And based off impressions of Tuesday, the Tigers might have slipped a little.